After five seasons with the Baltimore Ravens, C.J. Mosley is headed to the AFC East. According to NFL Network, Mosley has agreed to a five-year contract with the New York Jets worth $85 million, $51 million of it guaranteed. Mosley’s deal, which at $17 million annually is the richest ever for an inside linebacker, blows past the $54 million deal Kwon Alexander agreed to with the San Francisco 49ers on Monday. The 26-year-old Mosley led the Ravens’ top-ranked defense in tackles last fall, accumulating 105 stops over 15 games. It marked the fourth time Mosley put up at least 100 tackles with Baltimore. 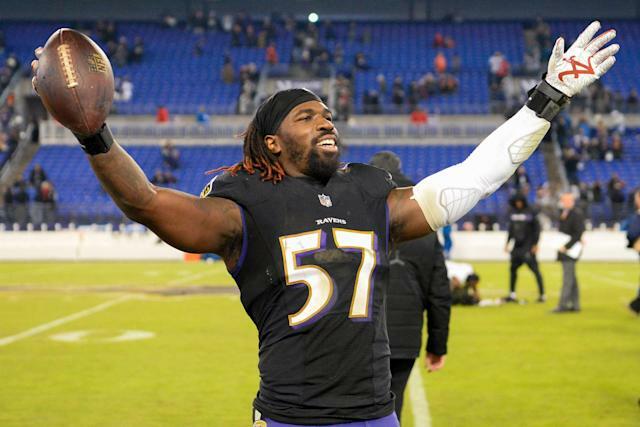 In all, Mosley totaled 597 tackles, 43 tackles for loss, nine interceptions, six forced fumbles and five fumble recoveries in his five years in the black and purple. But now Mosley will sport the green and white, becoming the team’s latest high-priced addition. The Jets also reportedly agreed to deals with linebacker Anthony Barr, wide receiver Jamison Crowder and special teams standout Josh Bellamy on Monday. Mosley, a 2014 first-round pick and four-time Pro Bowl selection, is the most high-profile of the bunch, providing a steady — and productive — presence in the middle of New York’s defense as it begins play under new defensive coordinator Gregg Williams, who was brought on by Adam Gase, the team’s new head coach. The additions of Mosley and Barr, coupled with Leonard Williams up front and Jamal Adams at safety, give the Jets an impressive collection of talent. And it’ll be Gase’s task to get things turned around with Sam Darnold and the offense.